In the summer of 2018 we began to review the school’s curriculum, it was nearly four years on since the new National Curriculum was introduced in 2014 and we wanted to rethink our offer. Learning from experience, keeping the best of 2014-18 but adding new aspects was the plan. Also making sure, as classes are mixed year groups, that all children get parity of experiences (but not necessarily identical ones) that there is no duplication of subject matter nor any omission of statutory content. We knew this was going to be a big job - begun in the summer we expect in its entirety it is a years work ! This is our first formal update for families ( Feb 2019) , we hope you are as interested and excited in this work as were are. Like all good projects it has centred around discussion, collaboration debate midnight oil and post it notes! At the same time the Diocese changed our statutory RE syllabus too. This stands alone—although we endeavour to link as much of it as possible to other learning and our teaching of British values. We have adapted the syllabus to match our school needs. One of the key aspects of our curriculum design has been deciding what we want our children to learn? What is the INTENT of the curriculum? These will be shared with parents so you can see what your child is learning and help support them to discuss their project. A copy of your child’s project KO will be sent home in black and white but a pdf emailed too; there is also a copy on their class page. All children have access to all curriculum opportunities , for some who have additional needs we may need to make reasonable adjustments to ensure this takes place. Please read more about this in our Special Educational Needs statement. Click here to go to the page. The National Curriculum is divided into subjects, each has its own Programme of Study (English, Maths and Science) or Purpose of Study ( all other subjects) . These are split in to Years 1, 2, 3 and 4*, 5 and 6*. Each Programme/Purpose of Study has specific Aims and Attainment Targets to be met by the end of a child’s time in that year. For maths and Science there are Programmes of Study for each Year 1 to 6. Other subjects are grouped for Y3/4 and 5/6. For some subjects, e.g. Art, the Purpose of Study is split simply into objectives for Key Stage 1 and Key Stage 2. As our children are in mixed age classes teacher’s take account of the Programme/Purpose of Study for both year groups and includes all the relevant objectives in the lesson. Differentiating up and down as appropriate. Curriculum for that age group or because there is an exciting or interesting local connection we want to explore. Sometimes a project is selected because the class teacher is a specialist in that area. As many links are made between lessons as possible and where practical off site trips or visiting experts are involved to enrich learning. The new National Curriculum has changed several subjects such as History and Geography in specific ways. 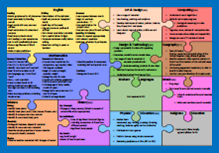 It is not always practice to teach the aims in the specific order similar to that on the jigsaw plan. However to avoid duplication of previous learning, to build continuity of new skills and to work around mix age group classes in the we may teach subjects in a different sequence. 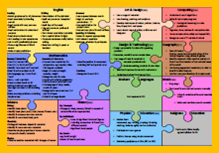 Each term class teachers will send out a detailed planning map explaining the subject areas being studied so families know in advance what their child will be learning about. These curriculum Umbrellas will also be posted on the web site.